Livingston manager Gary Holt says he would choose the club's artificial surface over a grass pitch. The West Lothian club laid a synthetic park over the summer to become the third Scottish Premiership outfit to do so. Plastic pitches have been criticised this season, including by Rangers boss Steven Gerrard, but Holt says it offers his Livi side an upper hand. "We are quite happy if people hammer it," he told BBC Scotland. "It's a massive advantage for us. We train on it every day and we love it. It makes it quicker." Gerrard had claimed no club in the Scottish top-flight should be using a synthetic surface after Jamie Murphy suffered a knee injury at Rugby Park that ruled the Scotland winger out for the rest of the season. 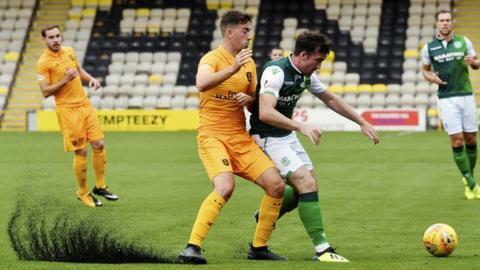 Early matches played on Livingston's pitch this season against Motherwell and Hibernian have shown heavy amounts of rubber pellets kick up during play. However, asked if he would change the pitch back to grass given the choice, Holt added: "No, because I put the one in at Falkirk. "The boys at Falkirk loved it and it enhanced our play. "We train on it every day and know how good it is. Yes, there is a bedding-in process because it's brand new. It will get sorted."